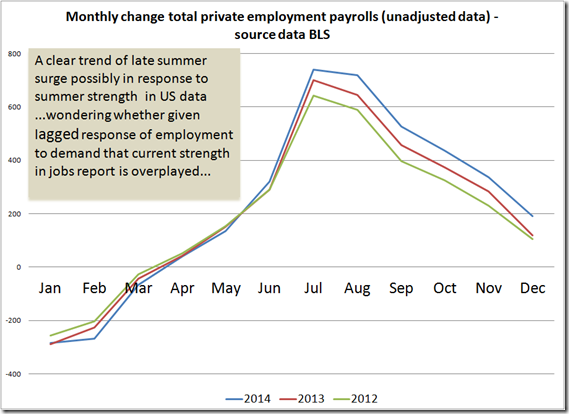 US Employment data, key points and filler! Unlike retail sales, industrial production, new orders or a number of other economic data, the employment report comes with a lot of extra filler. You need to dig down into the ingredients to figure what is and what is not good. 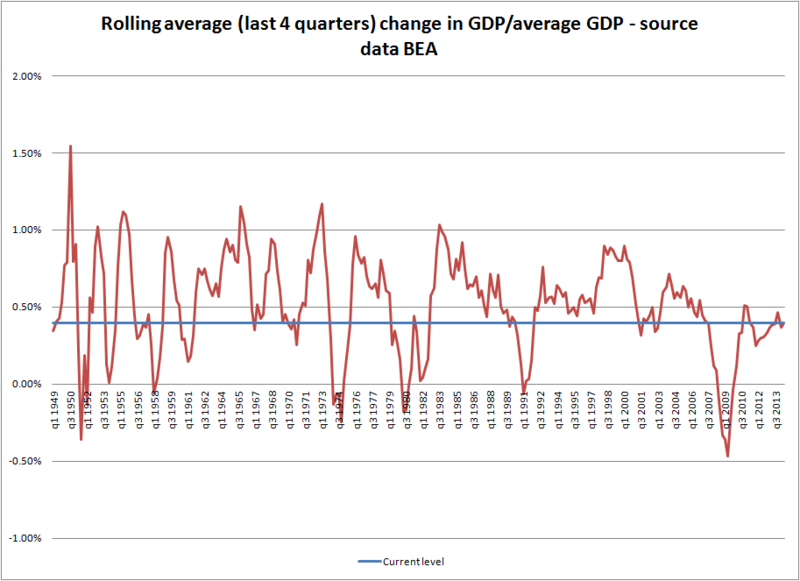 On the surface we have seen a recent deceleration, but nothing which looks out of the ordinary post 2009. But what do we see when we dig? 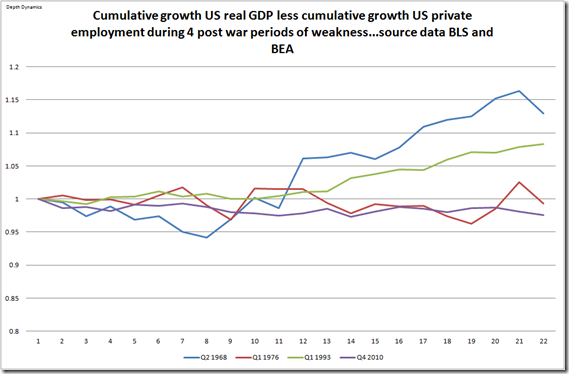 Productivity growth at post war lows! 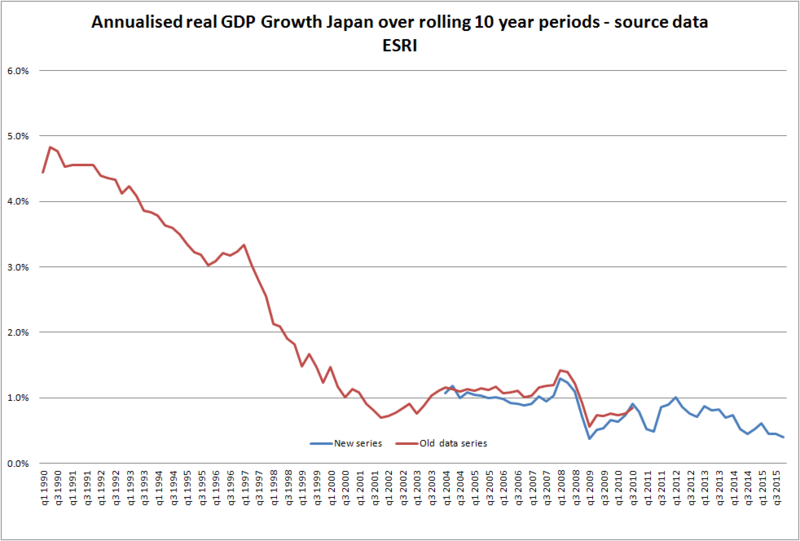 Employment data is producing less and less and becoming in GDP, asset price support and income growth terms, increasingly diluted. Health care and social assistance has been key to recent employment growth but the growth rate is falling off. Looking after an aging society may not produce the growth needed to sustain the liabilities attached to the economic frame. 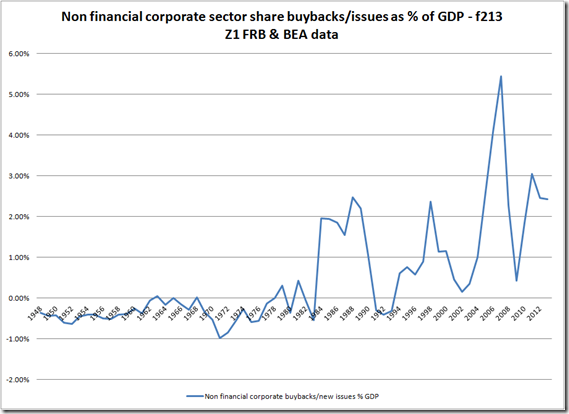 Indeed, many of these liabilities may not be adequately accounted for within asset valuations. If we exclude health care and social assistance from employment date, employment levels only returned to growth on an annual basis in October 2014, making the current employment growth cycle a short one to date. Add food service and drinking places employment (to health care and social assistance) and we have the sum total of jobs created since the recession started. But even food services and drinking places employment growth has shown a recent declining trend. Again, the income/productivity dynamics of this type of employment is unsupportive of the current asset/liability frame. Retail trade employment growth was especially strong during the latter part of 2015 (dominated by motor vehicles and parts dealers), although we have seen weakening of late. Watch out for MVP employment (which means an eye on consumer credit) and buildings and materials (which means an eye on construction). 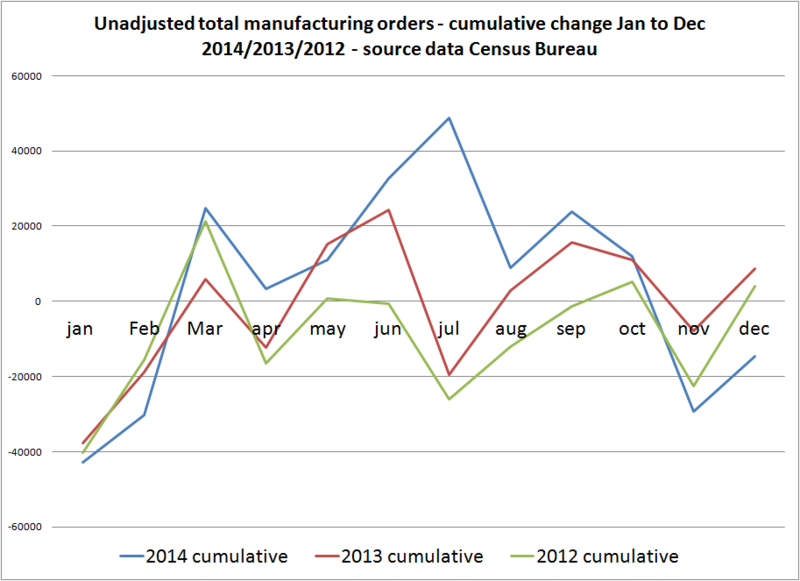 There has been weakness on the retail side that is obscured by recent April data. The weakness in the goods producing industries, construction excepted, and trade and transport is noteworthy in the light of weakness in output, new orders and exports. These are all key industries in terms of the economy’s ability to provide generate long term GDP, income and productivity growth. Manufacturing and trade are important cogs in the economic machine. The one relatively strong point in the data remains the professional and technical sub sector of professional services. Relative to service sector (and hence all employment) it has continued to rise in importance, but the growth rate of this dynamic has slowed in the current cycle. This may not be a positive for income flows if it represents a movement towards rationalisation of processes (reduced employment at the front end and a small increase at the operational core), reflective of cost reduction and other operational rationalisation. 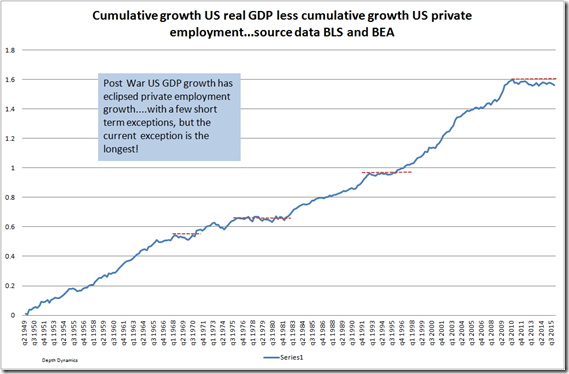 Long term dynamics – employment growth rates/part time versus full time/self employment versus employed – are all weakening or stuck in a post recession rut. A lot of recent employment gains look like they are due to a rise in part time employment (which may be a positive if it signals increasing willingness to hire) so growth fundamentals are still very weak and possibly weakening. What makes employment growth and the make up of employment growth so important is that it impacts productivity and earnings growth, two key factors that require vigour if we are to accommodate high debt levels and high asset prices. Other relevant relationships include capital investment (historically weak), income inequality and a slowdown in population growth as well as a shift in its demographics. Finally, with weak global trade dynamics we have considerable pressure on areas of the economy that have traditionally been important to productivity and earnings growth. There is nothing wrong in a declining population and declining growth rates of employment as long as the relationship between asset values (debt/equity) and consumption/investment dynamics are in keeping. I very much doubt whether it is and this is why employment growth today is a much more important indicator of financial health than it is fundamental economic health. There are so many straws in the wind! 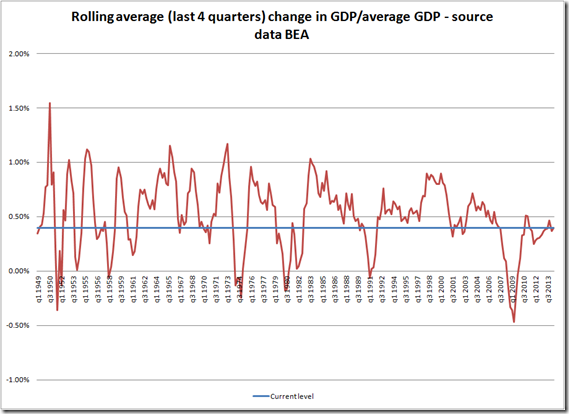 US Q1 GDP..big picture concerns conflate with shorter term weakness! 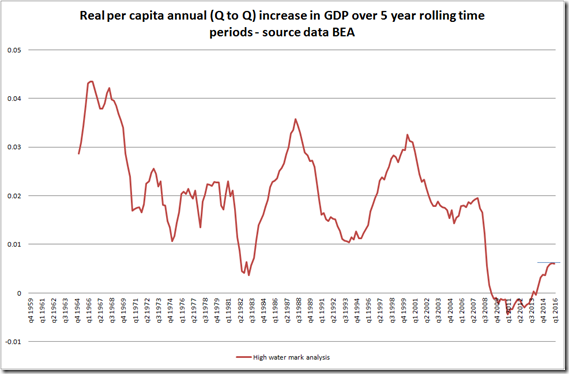 Preliminary US GDP grew by a real $22bn in the first quarter. Given that we are unlikely to see the weather related bounce back in growth that we saw last year, we are left wondering where growth is going to come from in the second and third quarters, especially if global trade fundamentals remain weak. We know new order growth had slowed considerably and had been sharply negative for some time at the nominal and moderately so at the real. The rate of decline has since halted, but real growth is pedestrian and looks to have plateaued at a time when headline employment rates suggest the economy is close to “full” employment. 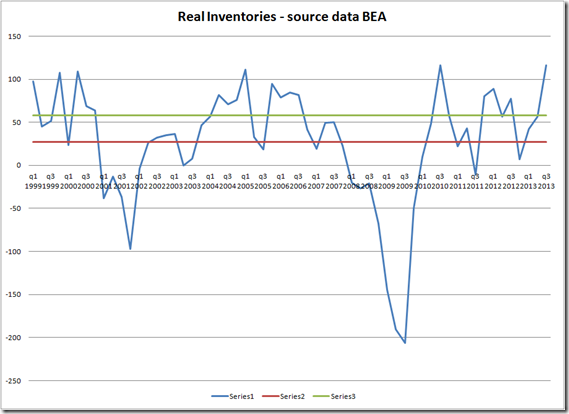 Inventories have been scaled back but remain high, and particularly so in the key motor vehicle and parts sector which has shown weakening in momentum and the notable transportation sector. Wage growth/consumer credit relationships are strained and it is difficult to see where domestic demand growth is going to come from, especially with the global weakness we have seen elsewhere. Manufacturing is a small but central cog in the machine: its components are used everywhere and a slowdown in one connected cog inevitably implies a changing dynamic elsewhere. With the recent CPI data I have updated my retail sales graphics. Takeaways? 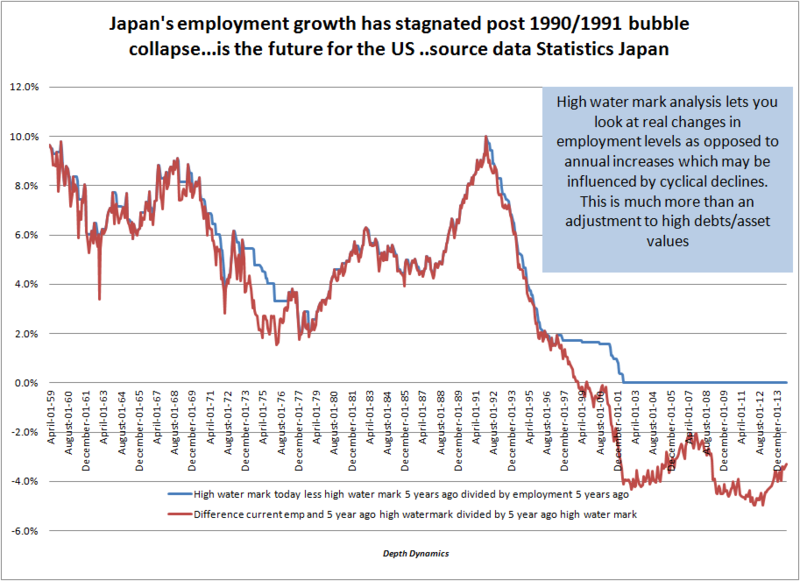 Would the real US employment figure please stand up: the Birth/Death adjustment debate. A number of commentators have questioned the underlying momentum in the US economy. 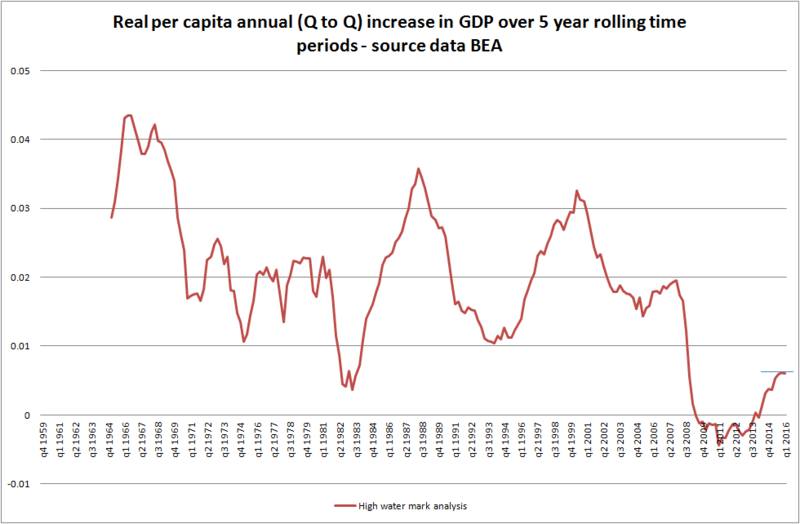 If we assume that today’s birth death adjustments are based on latest data as of Q4 2014, and 2014 Q4 showed the largest increase in employment since 1983, and the latter half of 2014 represented a relatively strong period of economic growth in the current cycle, then just maybe, if the cycle is turning, then there is a risk that current employment data may be increasingly wide of the mark. 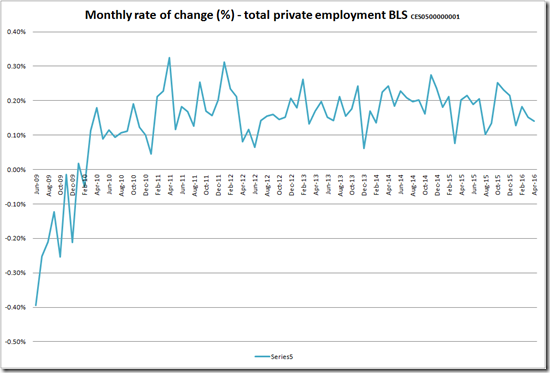 In the latest report on US employment we see private jobs growth averaging 222,000 a month over the last three months. On the face of it, employment growth suggests that all is well with the economy despite the slowdown in manufacturing and world trade. 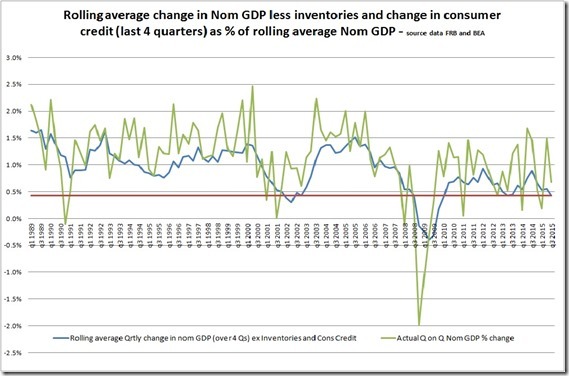 US employment figures in the context of consumer credit and inventories. The US economy is no ordinary cake in the oven and the release of the latest employment numbers do nothing to disprove this analogy. Global economic growth is continuing to slow as evidenced by trade numbers, manufacturing data and a host of PMIs. The direction of cause in this most recent of trends has been from key emerging economic regions. The direction of cause is one for concern given the importance of the development of consumer markets in emerging economies to aging and slowing developed economies. A slowdown in emerging market growth is important for asset markets and financial stability (loan servicing and financing) given that asset values and debt financing are heavily predicated on a discounted future. The possible impact on global growth and financial stability of this reversion of cause and hence flows may well prove to be of significance. In the context of interest rate decisions you have to ask yourself just what are we waiting for? I have seen that the IMF has asked the Fed to defer interest rate increases until we see clear signs of wage increases and inflationary pressure. The request IMO is both scary and rationale given that so much of today’s National Income Accounting Identity (output=C+I+X-M) relies on factors that lie outside of its operation. I speak of new bank generated loan growth given that income growth/distribution and investment growth still appear to be weak in the scheme of things..i.e. C+I the drivers. 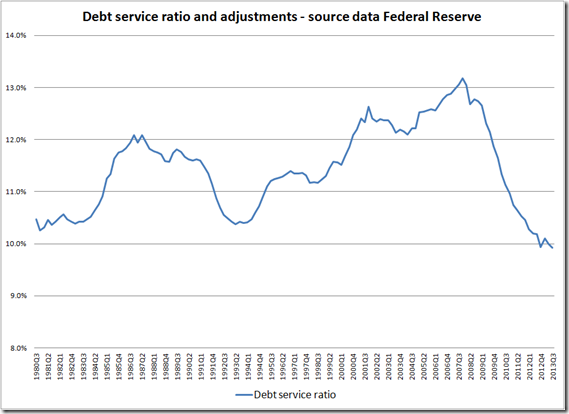 The last time the FRB delayed interest rate increases we had a debt financed consumption boom in the US followed by IR increases and a de facto financial collapse. By raising rates we likely restrict one of the few modes of generating consumption growth in the US (note auto loans) and many other countries. We also likely raise the impact of existing debt burdens on what are to date still historically low rates of income/wage growth. As such you have to ask yourself just what are we waiting for? Well we need higher income growth, but not just higher income growth: we need a more equitable and fair distribution so that economic growth itself becomes less reliant on debt and low interest rates, and less exposed to the scary divergence of asset values. But the world is also changing in ways that question whether we can effectively outwait the inevitable: populations are aging and declining. Areas where the frame can still expand in consumption terms, areas such as China, may be heading into their own period of slow growth and low IR debt support. Importantly will the status quo submit to a reconfiguration of the pie and can the world assume a less debt dependent economic raison d’etre? So yes, the rationale to defer interest rate rises is both scary and realistic, but it fails to answer important questions: what are we waiting for, how long can we wait, and are our hopes realistic? This is just a quick 3 minute post, but the issues are critical! 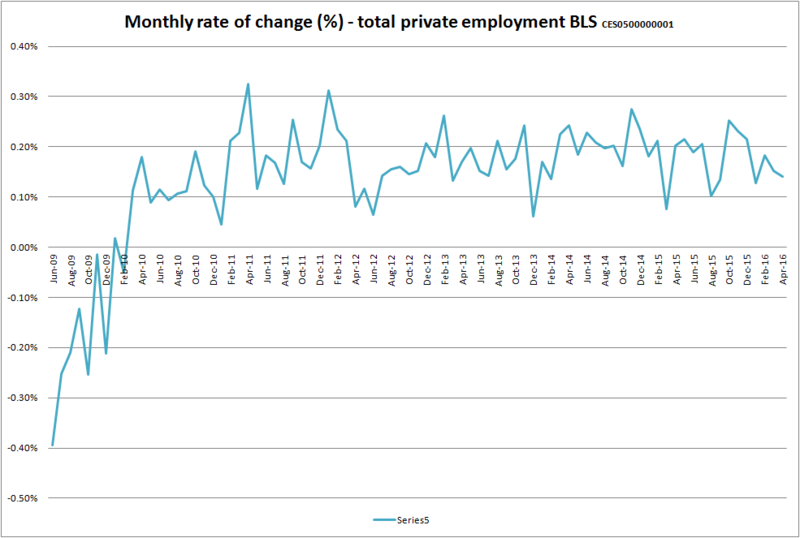 US total private sector employment growth: the rolling cumulative 5 year rate of change using high water mark analysis. 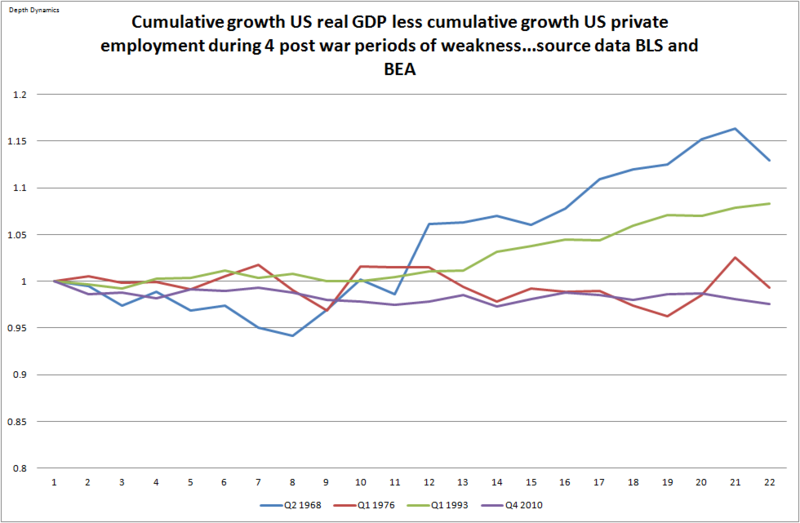 The last two growth cycles have been way below your typical post war level. And you wonder why economic growth is low? There is an increasing amount of data pointing to a general deceleration in economic growth since the summer, yet US employment numbers keep on movin’ on. Instead of going through the repetition of data points I thought it would be useful to look at employment data from another angle. Typically employment numbers are meant to be a coincident indicator of economic activity, but this is an average characteristic. 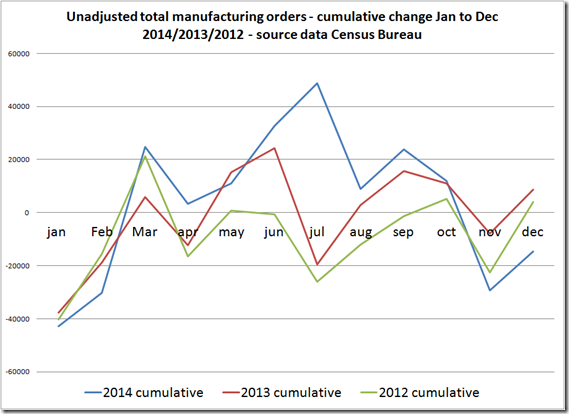 There will be times when it will be a lagging (catch up) or a leading indicator (job losses). 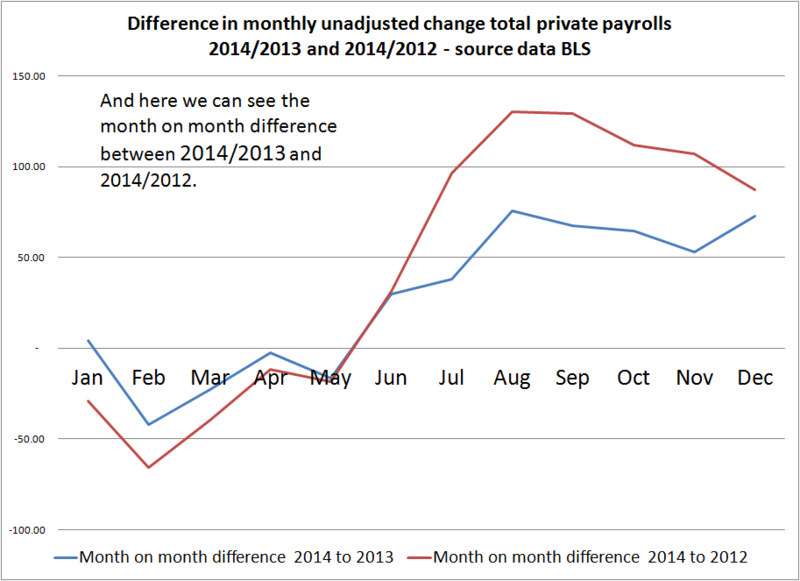 The above shows the monthly unadjusted change in total private employment over 2012, 2013 and 2014. We can see that the differential really opened up from mid summer onwards. 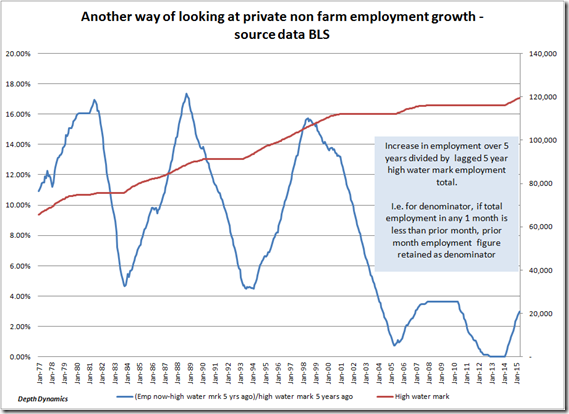 In my previous post I posted a graph of key US labour market dynamics…the growth in US employment (based on high water mark analysis). We know that there has been a slowdown in labour growth dynamics at the same time as we have had an increase in debt, increasing market volatility and a slowdown in economic growth. But did the financial shock and the long term impact of the unwinding on debt lead to weakening labour market dynamics or did weakening labour market dynamics leverage the impact of the shock and the debt? 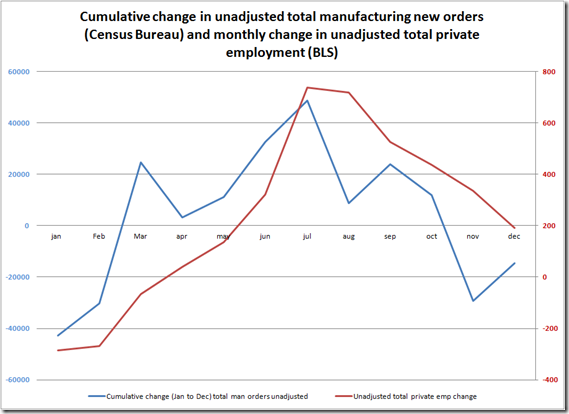 US employment data..some important charts..secular stagnation? 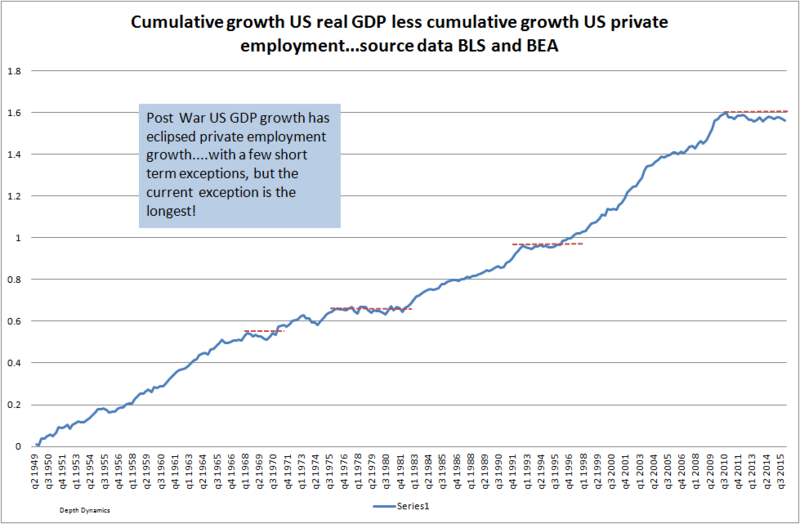 The above shows that the long term growth in total private sector employment in the US has fallen off the edge of a cliff since the late 1990s. 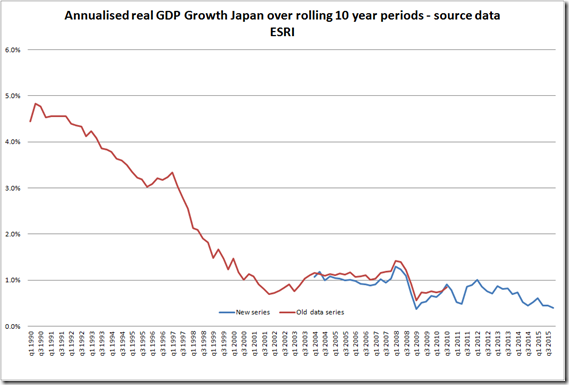 The trend was already set in the post 2001 recovery and has continued to date. 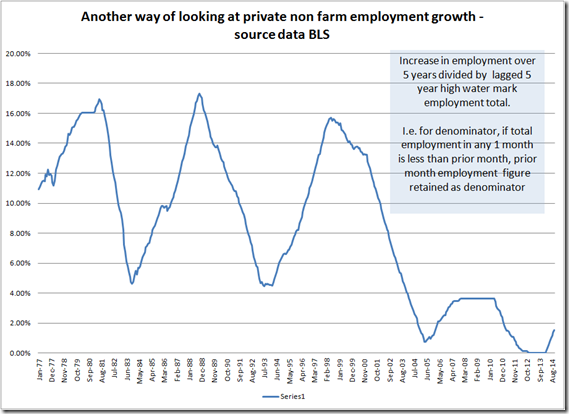 Employment growth is particularly important for economic growth. The above chart is astonishing in this respect. 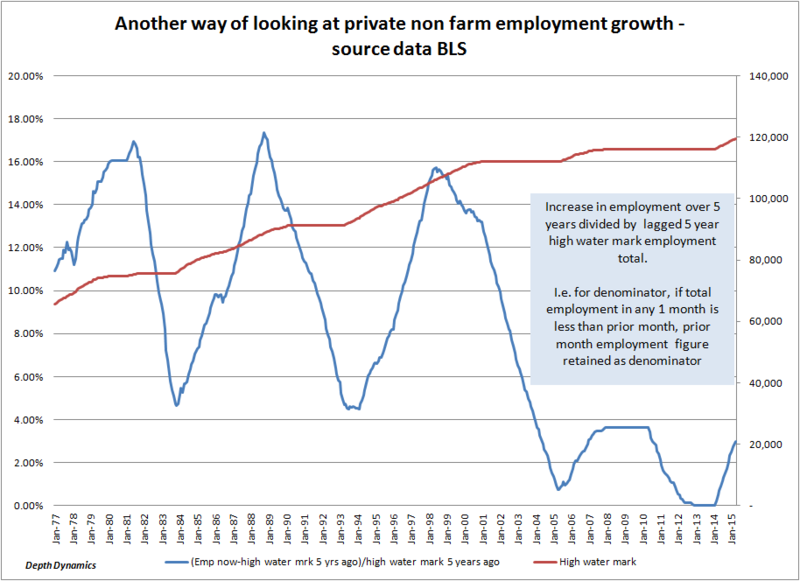 I have summed rolling 5 year growth in employment and divided it by the employment level 5 years previously…the one adjustment I have made is to set 5 year previous employment figure as a high water mark input. 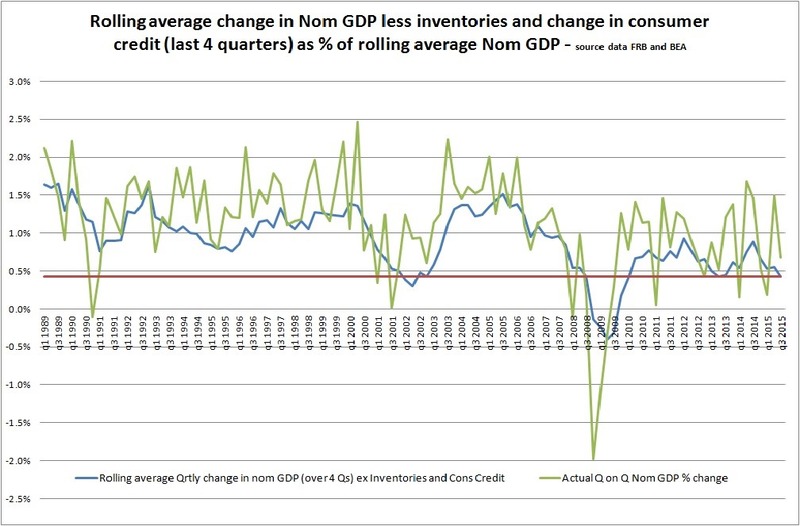 Short term data has varied wildly of late; such can often obscure the underlying trend: what if we adjust for inventories and changes in consumer credit? Well we see less noise for one, but we also see a slower underlying growth profile – yes, credit creation is part and parcel of growing expenditure but I still feel we are in a high debt/deleveraging and weak income growth dynamic that needs to be especially sensitive to growth in credit/debt. 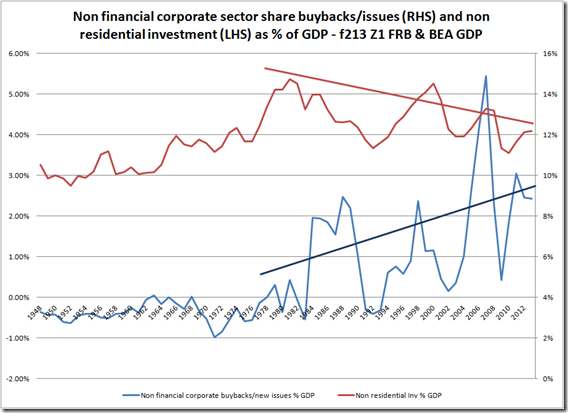 I just wanted to extend the line of thought I was developing in my previous blog post: that is of the synchronisation of weak growth/capex and the increasing amount of corporate capital being allocated to share buybacks. To a certain extent they all have one common thread, and that is a depreciation of corporate assets both current human and capital, and, with respect to the future, lower future rates of productivity growth that reduced human/capex investment imply. 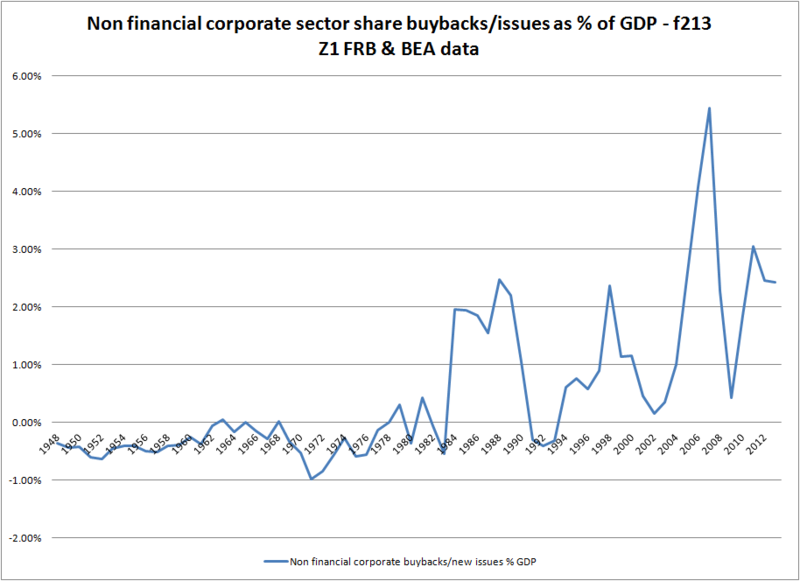 I also thought it worthwhile noting the decline in shareholder capital on the balance sheet of corporations like IBM and the increase in liabilities. Companies are becoming more highly leveraged at a time when economic growth and its important driver, income growth, is on a distinctly weakening trend. So when the cycle turns, what should we expect to see happen first? 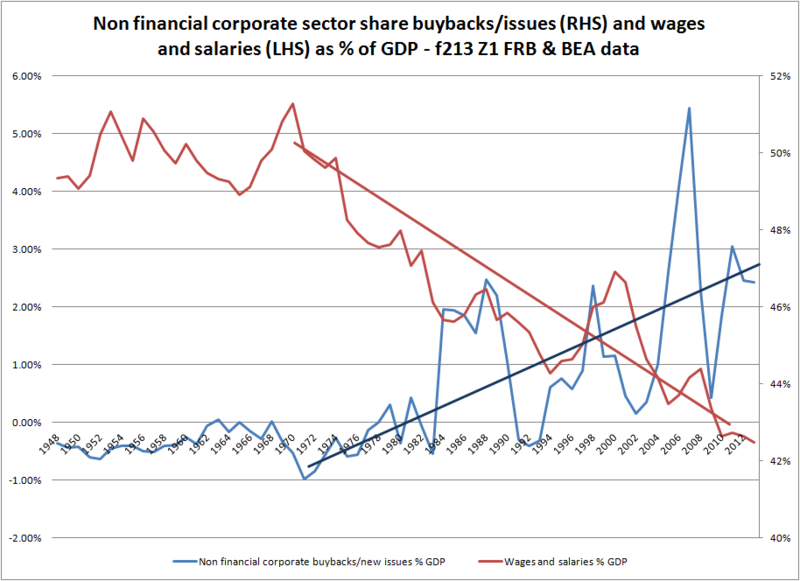 An uptick in wages followed by capex and new issuance, or would buybacks slack off first, followed then by wage growth and finally capital expenditure. Or should we first look earlier in the chain to the composition of employment? If we are in a strong stagnation dynamic I would expect that the economy would move through several iterations before a new wage growth cycle gains its own momentum. 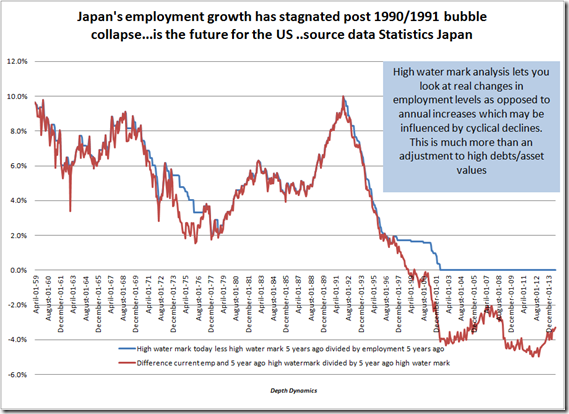 And there are many stagnation dynamics overlaying the economic structure…. More and more people are talking about declining real and nominal wage growth and more and more people are asking when is wage growth going to pick up. It is a very good point. But I think we need to look at the dynamics of wage growth from another perspective. This perspective is that of human capital investment: wages are an investment in human capital and you pay more when you want to invest/upgrade/increase productivity etc. If you expect to grow and you expect to depend on investment in human capital to grow, you will invest more, and one indicator of this investment is wages. 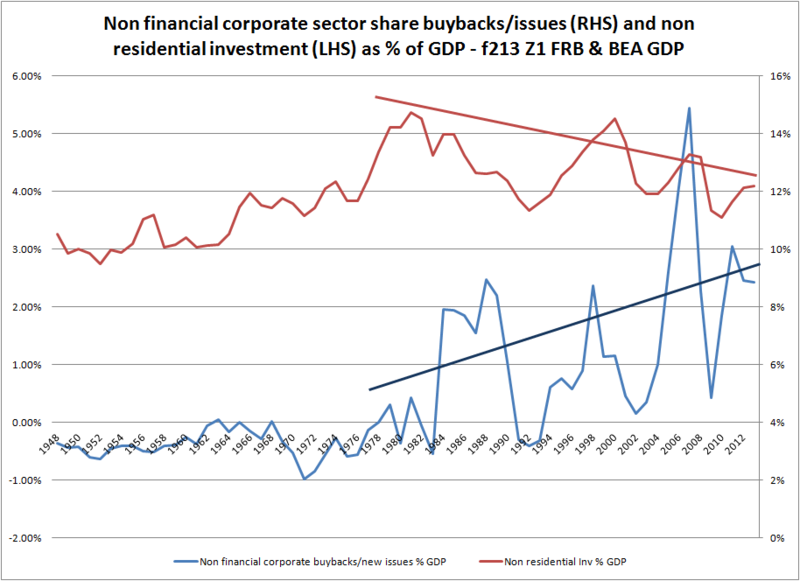 Now, we know that capital investment as a % of GDP has been declining for some time and we also know that corporations have been buying back shares and borrowing money to do so. 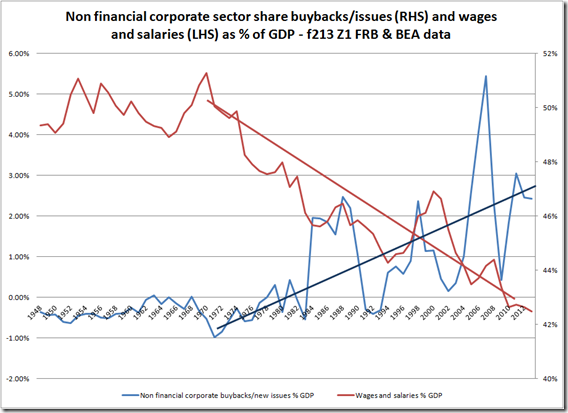 But these three (wages, capex, buybacks) all look to me to be pretty synchronised. It looks pretty much as if corporations are adjusting to lower long term economic growth either as a consequence of lower wage growth, less investment or some other natural dynamic —productivity/TFP or demographic dynamic. Of those who discuss the issue of secular stagnation many point to the 1980s as the starting point and the trends noted above would fit into this timeframe…. 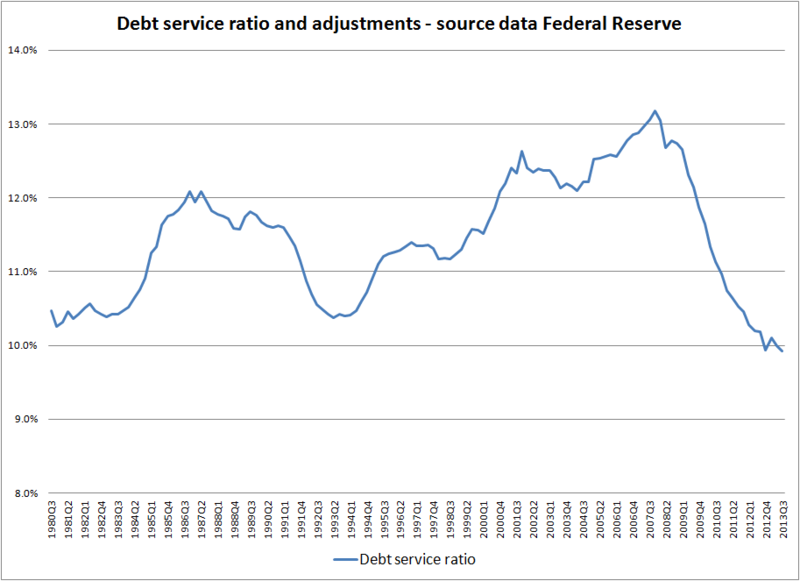 If you look at debt service ratios from 2008 to date you would be led to believe that consumer indebtedness has improved markedly. In fact you would believe that conditions are the best they have been since at least the early 1980s. But if you broaden your perspective you find that conditions today have not strayed too much from those conditions which have been in place for much of the last 14 years. 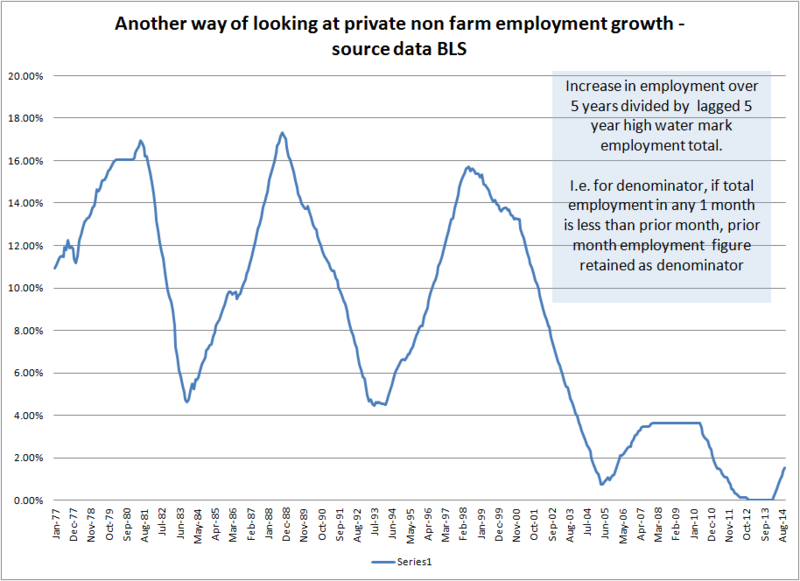 Some charts on US employment data drawn from the BLS CES and CPS surveys. Yes employment is back to where it started the recession, but adjusted for civilian population growth not even close, and part time and self employed data points are still hanging in the reverb. Participation rates are also still way below pre recession peaks and there is a question mark over multiple job holders, which have risen significantly of late and may have contributed to some of the more impressive recent job gains. A great deal of the growth in employment over the last few decades has been concentrated in the health and education sectors. Student debt has become a major problem post the onset of the current financial crisis and health care has likewise become, over time, a tremendous economic cost and a structural barrier to growth. Increases in private payroll employment are weak in historical terms. But if only that were the only issue: weak population growth, falling participation rates, elevated part time employment and continued weakness in self employed categories raise serious concerns for growth dynamics. 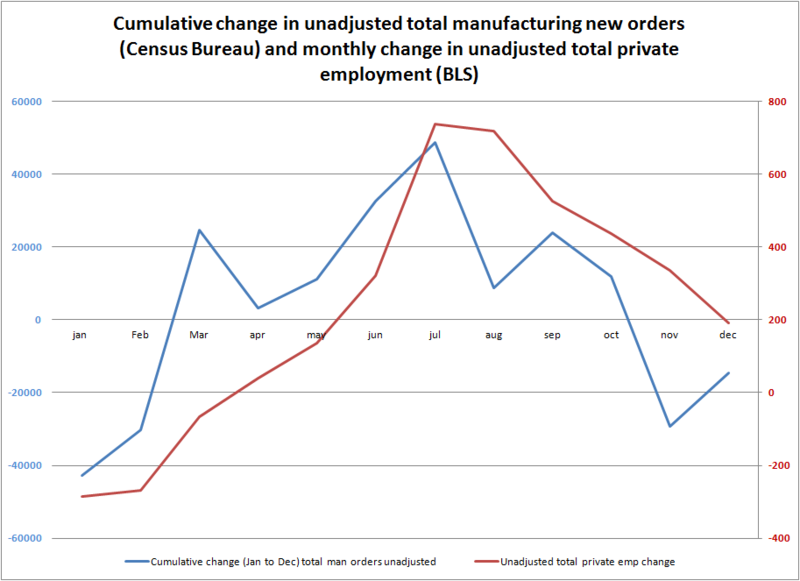 The last two employment reports have been casting a shadow over the strength of the economic recovery. Just focussing on the last two months of data probably does some disservice to the underlying fundamentals. October and November were relatively strong months, and although we can see a slowing trend (blue line, 4 month average), the last two months may be more correctly viewed as an adjustment. The weather may or may not have had an impact. 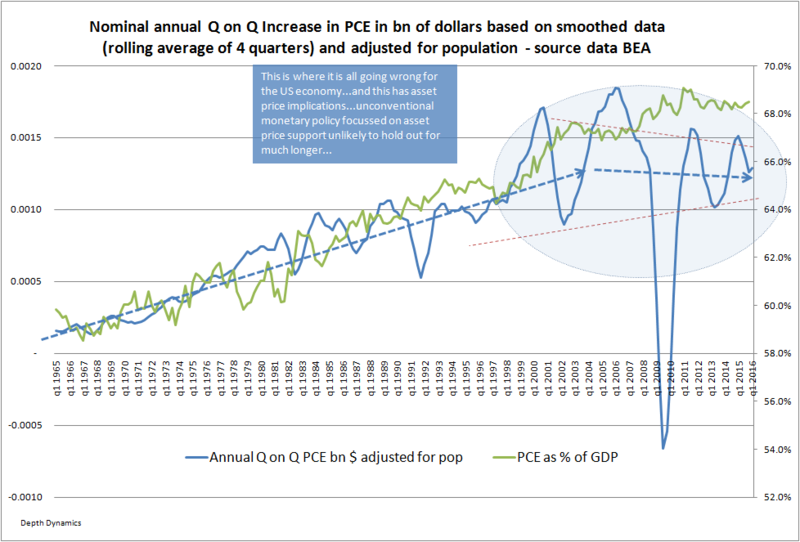 But what if we adjust for low real earnings growth and lower savings rates (source data BEA)? 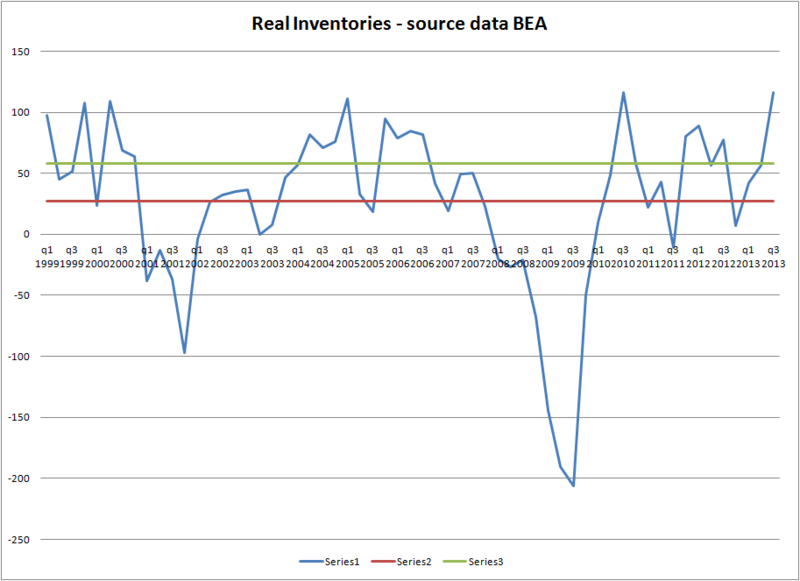 US employment data: perched atop an inventory cycle! US employment data looks to be perched atop an inventory cycle, and given that the recent rise in inventories is high historically, recent employment data may well not be as strong an indicator of the health of the economy as some may think. Total private sector employment increased by 152,000, but the prior month’s figures were revised down by 36,000. The last two months of increases represent the lowest two monthly increase since September of last year. 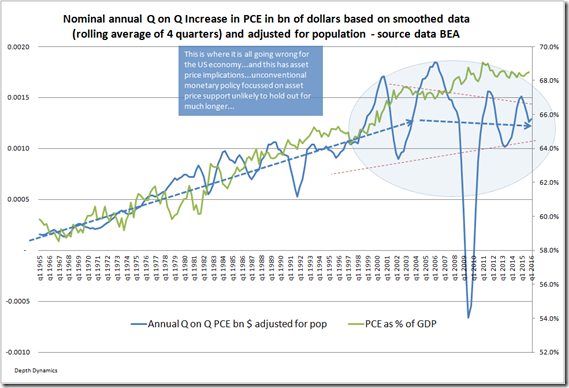 Differences between the CES and CPS survey data…. Many have noted the difference between the Current Population Survey (sampled data but wider spectrum) and the CES payroll data, but there is a two step pattern here.